Medipass Healthcare announced today that it has been short-listed for the 10-year Radiotherapy and Chemotherapy Services MES contract with Norfolk and Norwich University Hospitals NHS Foundation Trust. NNUH is one of the busiest teaching hospitals in England. 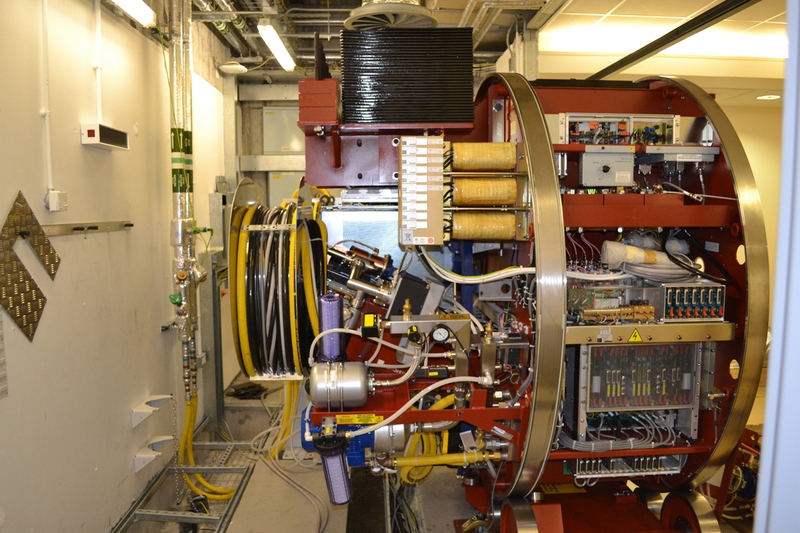 The scheme is expected to cover the replacement of the existing 5 linear accelerators, CT sim, Brachytherapy suite and orthovoltage unit and encompasses a strong research and development partnership. Medipass Healthcare is set to go live with a new engineering work flow and asset management system – Integra’s e-Quip – at its Belfast MES site. The design of the e-Quip system was based on over 10 years of experience within Integra working with some of the largest Medical Physics and EBME departments in the UK. Medipass also employs the e-Quip system at its MES in the Leeds Cancer Centre, which will ensure we can also work in concert with the asset management system that the Leeds Teaching Hospitals uses across all its sites. Medipass Healthcare has been awarded a 12-year contract for the provision of all major radiology equipment to the Surrey and Sussex Healthcare NHS Trust. Medipass was successful in securing this contract amongst a strong field of contenders that included major manufacturers and other MES companies who were also bidding. Medipass will be increasing the Trust’s MRI capacity at the East Surrey Hospital to include a new MRI scanner, taking it to 2 machines on site as well as replacing obsolete analogue equipment throughout the sites with fully digital technology. As part of its ongoing MES replenishment program, Medipass Healthcare has installed a new GE Optima MR 450w GEM system in the regional Cancer Centre at Belfast City Hospital. The new MR was selected for its ability to combine the benefits of wide-bore imaging with GE¹s GEM technology (Geometry Embracing Method). 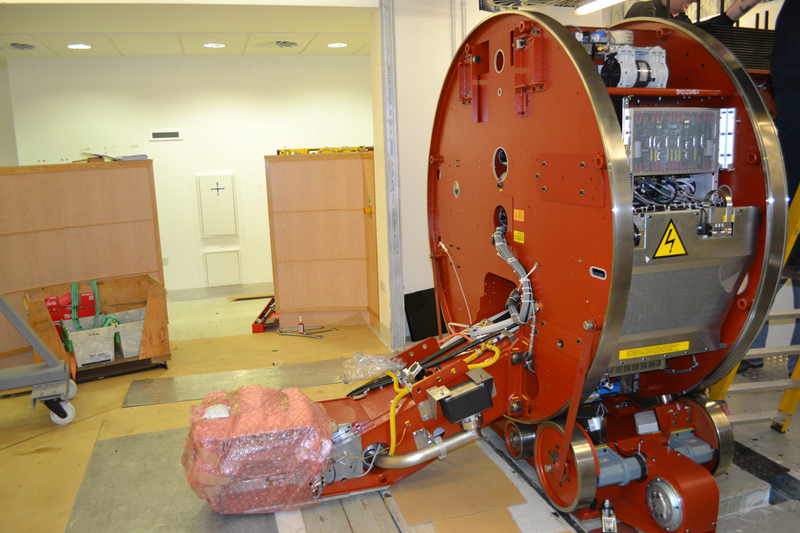 This replacement incorporates an approach to MR imaging that reflects the importance of conforming the geometry of the equipment to that of the patient¹s body and movements. This is another example of Medipass Healthcare’s philosophy of providing technology that is not only highly advanced, but also patient-centric, bringing state-of-the art treatment in line with comfort and care for patients. Medipass has appointed Gaile Smyth as MES Manager at its Belfast site. Prior to taking up her new post with Medipass, Gaile was the Radiotherapy Services Manager for the Northern Ireland Cancer Centre, a position she held for more than 14 years. Gaile has a dynamic background in radiotherapy clinical services and management with extensive experience in the NHS. Since qualifying as a therapeutic radiographer in 1982, she has held a number of clinical positions during her career as a radiographer and at the same time furthered her academic achievements, completing a Master’s in Business Administration at University of Ulster. Gaile was also an integral part of the project team for the Cancer Centre project at Belfast City Hospital from its inception, and was involved from the start with the MES at a clinical operational level. Along with clinical colleagues she helped manage the smooth transition of radiotherapy services from Belvoir Park Hospital to the new Cancer Centre in March 2006. In more recent times she has been involved with the planning and equipment selection for the new department currently being built at Altnagelvin in Londonderry, which will expand capacity and improve radiotherapy access to the population in the North-West of the province and Donegal in the Republic of Ireland. With Gaile’s appointment as MES Manager, Medipass continue to ensure a strong local management team is in place at each of its MES sites. 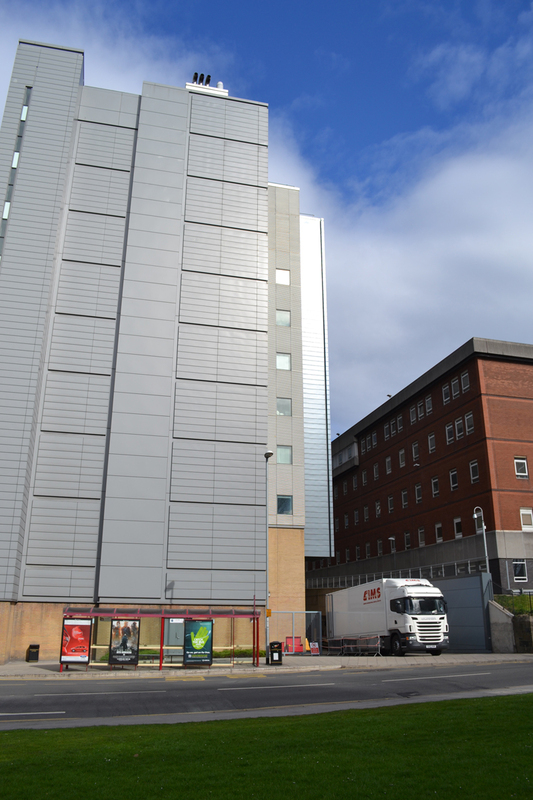 After the successful installation of a new MRI at the Medipass MES in Leeds, a formal survey was conducted with the clinical users by the Trust administration to gain feedback on how well the procurement and installation process had been handled by Medipass. This survey was non-biased and was completed without any input from Medipass. The responses confirmed that the clinical department was very satisfied with every aspect of the equipment replacement process. In particular, gratitude was expressed for the way Medipass staff did all that they could do to meet and exceed Trust requirements and requests. It was felt by all users that Medipass staff worked closely with the Trust to obtain the optimal specification scanner within band and supported the evaluation process. Specific to the building works, it was felt that Medipass carried out the contract very well in all aspects. The removal of the replaced scanner was carried out to schedule and within budget. A successful long-term partnership between Medipass Healthcare and the Leeds Teaching Hospitals NHS Trust has recently brought the Nuclear Medicine Department in the Leeds Cancer Centre to the forefront of technology. Dr Fahmid Chowdhury, Consultant Radiologist and Clinical Lead for Nuclear Medicine at the Leeds Teaching Hospitals NHS Trust, said, “The flexibility of the MES provided by Medipass Healthcare has been instrumental in making world-leading technology available to our patients at a time of considerable financial restraints in the NHS." 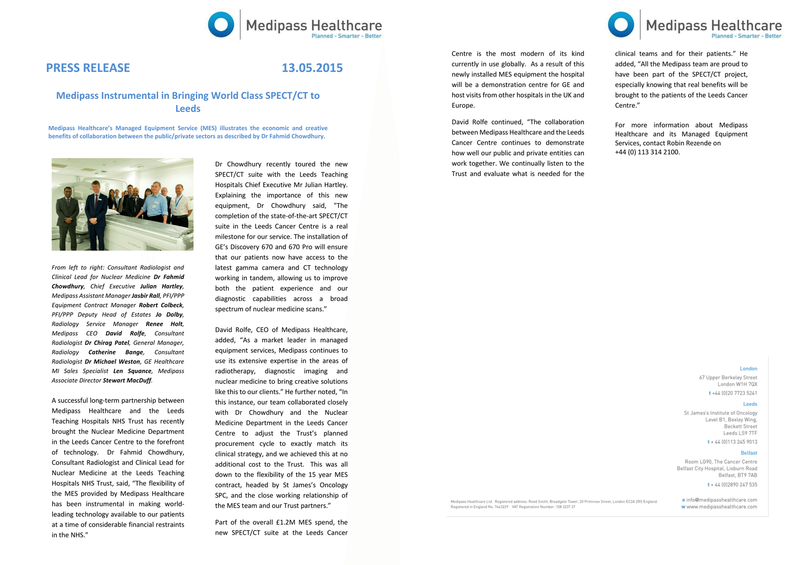 Click Here to view the press release or click here to download in PDF format. 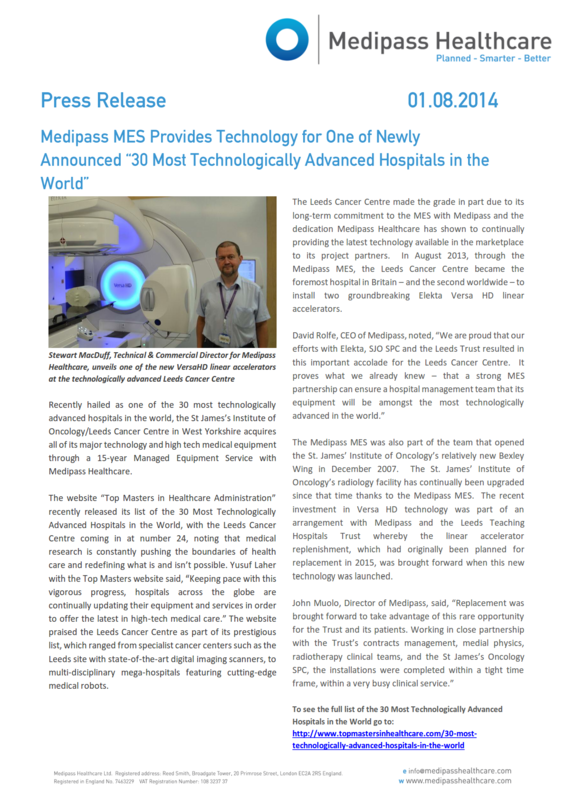 Recently hailed as one of the 30 most technologically advanced hospitals in the world, the St James’s Institute of Oncology/Leeds Cancer Centre in West Yorkshire acquires all of its major technology and high tech medical equipment through a 15-year Managed Equipment Service with Medipass Healthcare. 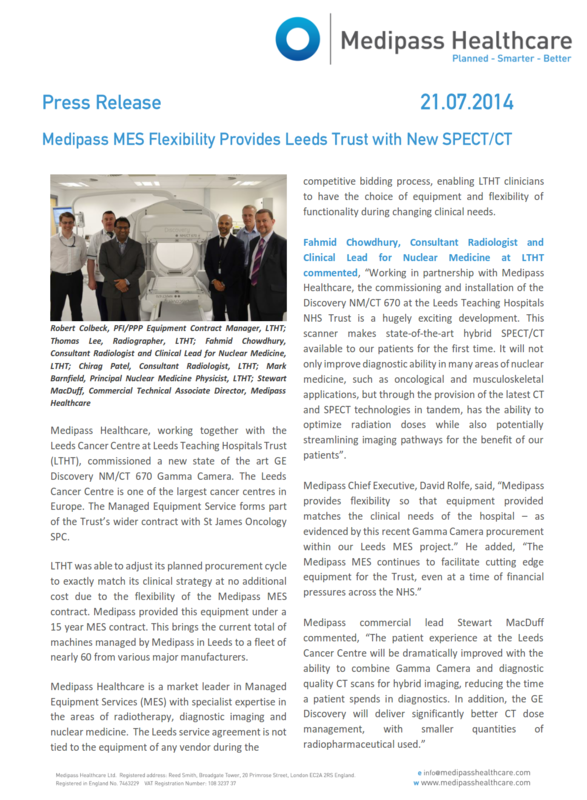 Medipass Healthcare, working together with the Leeds Cancer Centre at Leeds Teaching Hospitals Trust (LTHT), commissioned a new state of the art GE Discovery NM/CT 670 Gamma Camera. 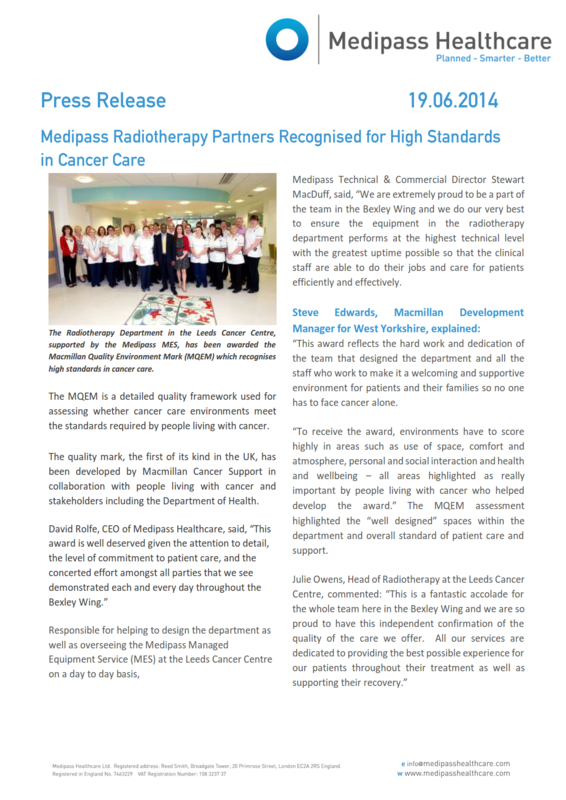 The Radiotherapy Department in the Leeds Cancer Centre, supported by the Medipass MES, has been awarded the Macmillan Quality Environment Mark (MQEM) which recognises high standards in cancer care. 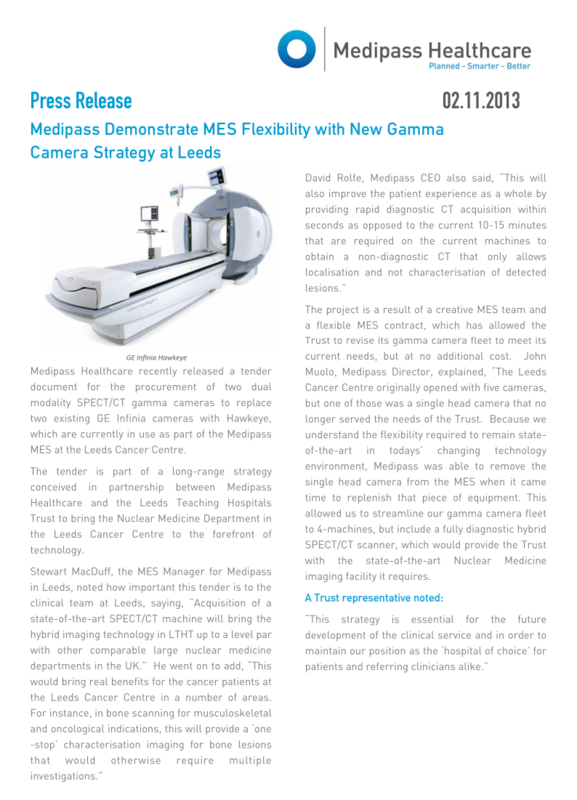 Medipass Healthcare recently released a tender document for the procurement of two dual modality SPECT/CT gamma cameras to replace two existing GE Infinia cameras with Hawkeye, which are currently in use as part of the Medipass MES at the Leeds Cancer Centre. 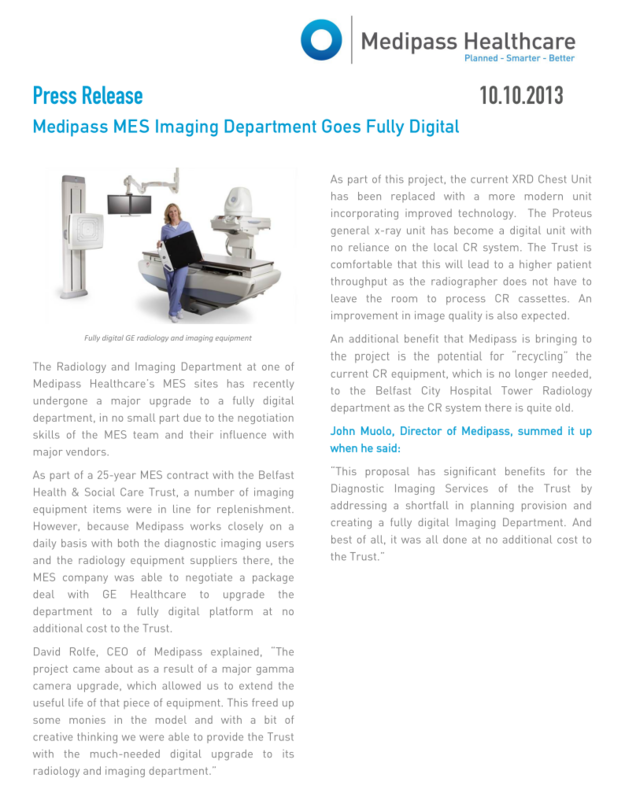 The Radiology and Imaging Department at one of Medipass Healthcare’s MES sites has recently undergone a major upgrade to a fully digital department, in no small part due to the negotiation skills of the MES team and their influence with major vendors. 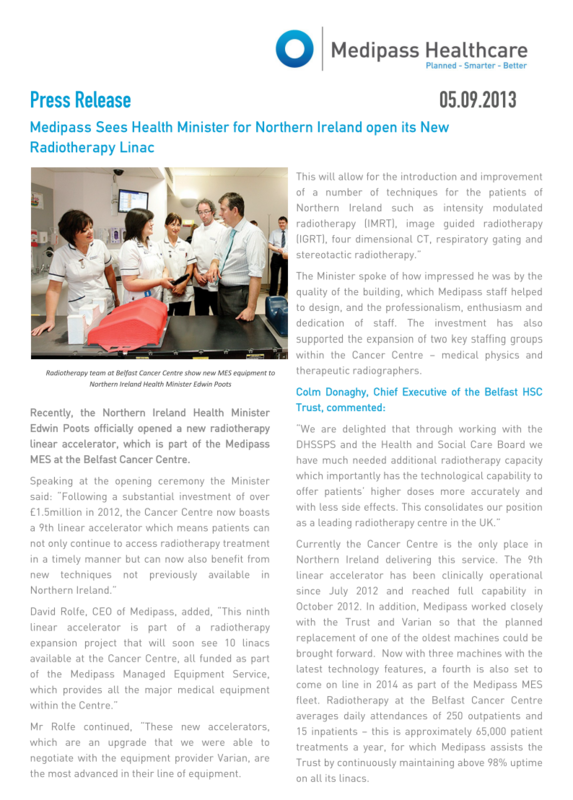 Recently, the Northern Ireland Health Minister Edwin Poots officially opened a new radiotherapy linear accelerator, which is part of the Medipass MES at the Belfast Cancer Centre. 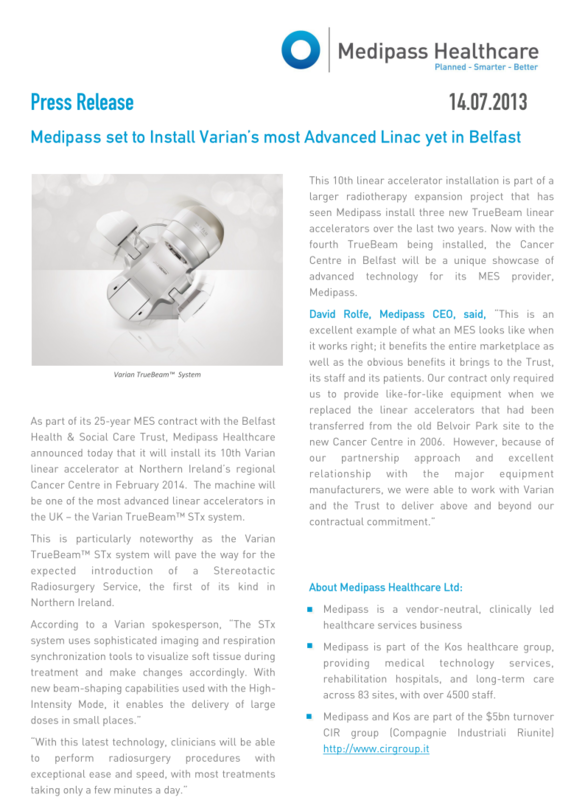 As part of its 25-year MES contract with the Belfast Health & Social Care Trust, Medipass Healthcare announced today that it will install its 10th Varian linear accelerator at Northern Ireland’s regional Cancer Centre in February 2014.